In the rich annals of German football, the name Burkhardt Pape may not spring to mind in the way the likes of Gerd Muller, Gunter Netzer and Lothar Mattheus do, but he does have his only little place in history. 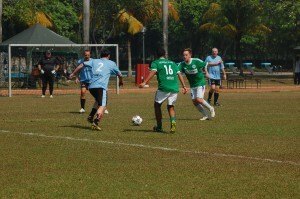 On 22 November 1981, expat football side German Plus played Mandarin Hotel and ran out comfortable 6-1 winners. Appearing on the score sheet was a certain Pape, formerly of Hannover 69 and later to coach in Papua New Guinea, Indonesia, Thailand and Uganda where one commentator described him as the most successful in their history. By the time he lined up for German Plus, Pape was in his early 50s but could still offer something on the field. As for his team, they were already 17 years old. Some mental arithmetic will soon tell us the expat-based football club are now celebrating their 50th anniversary – a remarkable achievement and testament to the staying power of an institution in what is a transient world. All a far cry from their club’s humble beginnings back in 1964 in what was a very different Jakarta. Sukarno was still president, though massive changes were just months away and Jakarta was still a pretty low-rise place where congestion and pollution were not on the radar. It all began, like so many good ideas, at a meeting in a bar at the old Hotel Indonesia with some German businessmen, gathering together for a quiet beer or six. 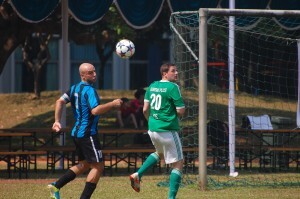 With little in the way of social activities to keep people amused outside of work, their liquid-fuelled chat ended with the idea of a football team which they named GFCD Concordia (United German Football Club Djakarta). Today, they are more than just a social football club. German Plus have morphed into a roaming embassy; 11 diplomats in sweaty shirts and shorts, presenting German soft power across Indonesia. There have been some misunderstandings along the way. Take, for example, the time they travelled to Karawang in West Java. Then, as now, German Plus took to the field wearing the national team’s kit and somehow word had got around that it was the actual German national team that were playing in the then remote town, which explains why more than 15,000 fans turned up! Karawang won the game comfortably enough, 5-2, and no doubt put their success down to their guest’s long and arduous journey from Berlin! 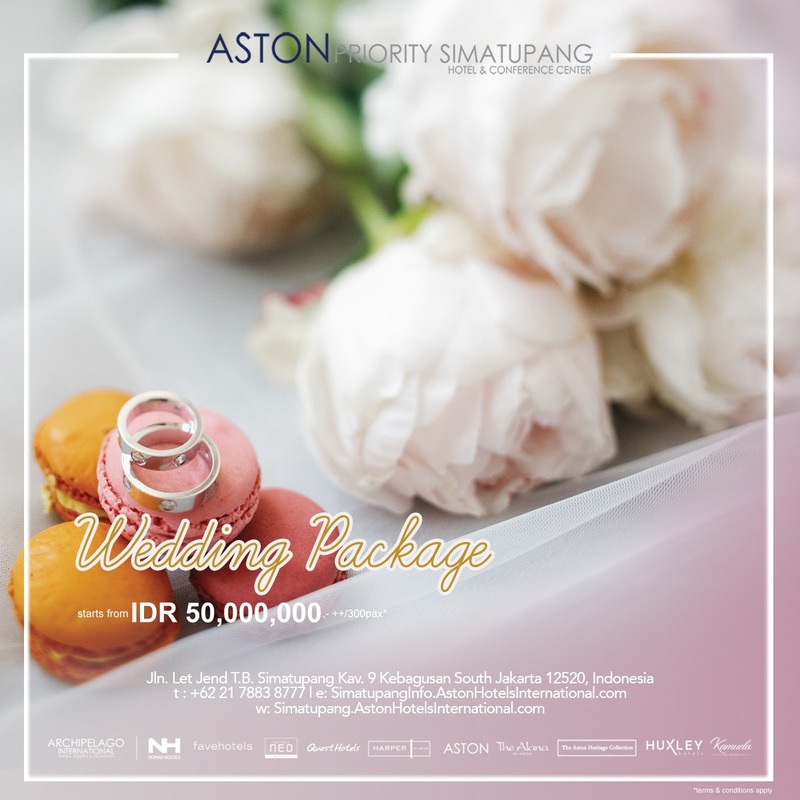 Over the years, they have also travelled to places as far-flung as Bali, Flores and West Sumatra. Such was their pomp at the time they were invited to North Sumatra, and included in their line up Brazilian Jairo Matos, once of Atletico Minero and later to coach PSMS. The game was played at Teladan Stadium in Medan and fans were allowed in free. The Germans won the game 2-0 in front of a full house. 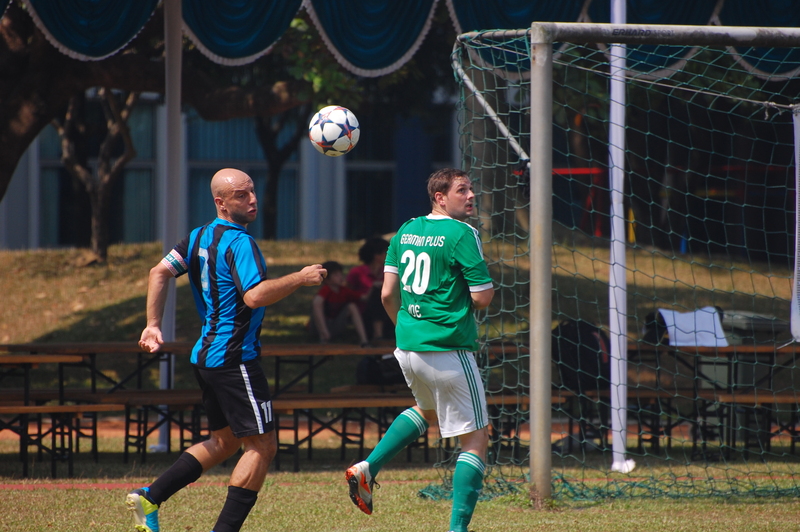 In the more humble Jakarta International Football League, which kicked off in 1990, German Plus proved to be the dominant force during its early days. During the decade, they lifted the prestigious trophy four times and were runners up on a further three occasions. In 1998, the riots hit Jakarta and many of the team were relocated elsewhere, as people took flight but they still ended the year winning the cup and indeed a hardy few stuck around during the darkest days, determined to kick a ball come what may! The last few years have been a bit tougher on German Plus on the field, as the Latino Sabars have dominated events and the trophies, but the Germans continue to do their thing. 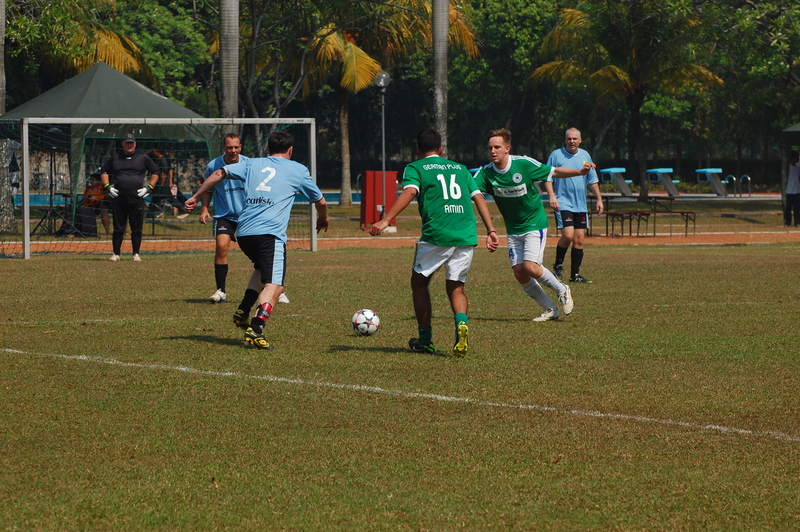 To celebrate their golden anniversary, they hosted a special six-a-side event in deepest Serpong, inviting along some old friends, including Jakarta Vikings, DoIt United, Swiss German University, German All Stars Singapore, German International School, Selebrities FC, Nomads, De Hooi and Jakarta International School. With a 9 o’clock start on a hot Saturday morning, there were more than a few players looking a tad frail as they sought shelter from the rays. But once they got on the pitch, the excesses of the previous not were forgotten and the tackles flew in thick and fast, with regular abuse directed at the referee for good measure. While the Germans have been celebrating their anniversary off the pitch, on it there has been less to cheer. 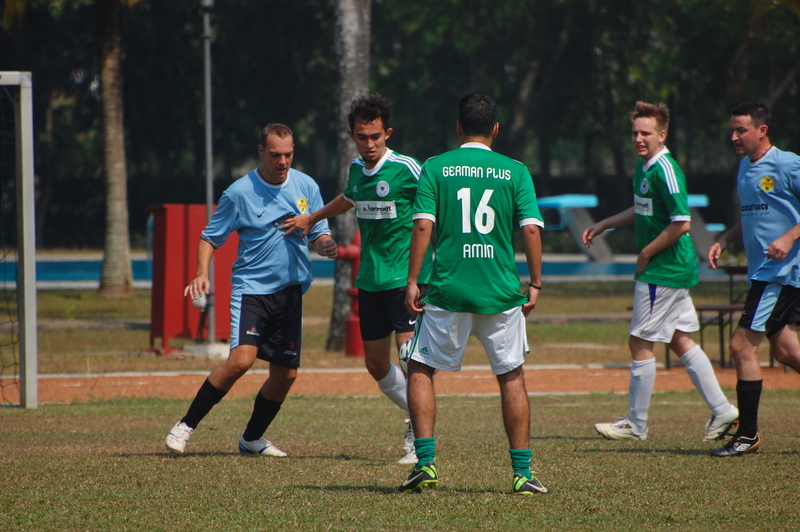 The Jakarta International Football League is still in its early stages but German Plus has struggled. They lost their first game of the campaign 9-2 against the all conquering Sabar Latinos, and while they have tightened the defence somewhat since that debacle, they still have no points on the board. The De Hooi Nomads thumped them 4-0, thanks to an impressive four goal haul by Ably Francois and followed that up with a 3-1 loss against the Japanese side called Japan. Their only other game at the time of writing came in a 4-0 reverse against the Vikings. The club have responded to a poor run of form by hosting Kampung FC in a friendly, overcoming them 8-3, Frank Kleinteich netting a hat trick. It remains to be seen whether that win will translate into an upturn in fortunes in the JIFL. Anyway, what about the Plus in their name? Where does that come from? Apparently, following one defeat against the Germans, a JIFL team suggested the full name for the team was in fact German Plus a Couple of Professionals!